I was trawling the shelves last week for a new book to read, and became interested in my top shelf, which is mostly stocked liberally with humour books, trivia books, a few things from my childhood. 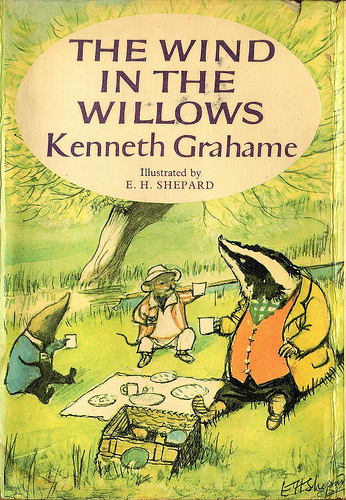 However, my attention was grabbed by The Wind In The Willows, which I plucked down, blew dust from and immediately decided that it needed to be read. I didn’t even know I owned it, sat up there sandwiched between Black Beauty and The Swiss Family Robinson, both of which were also something of a surprise. Where the books came from is anyone’s guess, but I may have inherited them down from my mother. My copy of Willows is from 1981 and apparently cost 95p on release. Ah, inflation. Having seen a few adaptations of the novel, I realised that I’ve never actually read the original book, a fact that needed rectifying post haste. This is the story of four animal friends – Mole, Ratty, Toad and Badger – and the adventures they get up to in their forest and on the riverbank. It begins with kind and sensible Mole getting tired of his spring cleaning and heading out into the wider world. He stumbles upon the river for the first time and there he meets Ratty, a dreamer who wants nothing more than to please his friends and spend his days “simply messing about in boats”. He loves the river and his life, and soon he and Mole are spending every day together. Ratty introduces Mole to his friend Toad, a very wealthy amphibian who lives in Toad Hall, a huge, decadent mansion and, while he’s smart and very friendly, he’s also arrogant in the extreme and prone to getting obsessions that consume him fully. The final member of the main quartet is Badger, a wise old mammal who dislikes Society and will only come find you if he wants to speak to you. He appears to run the Wild Woods with an iron paw, but he’s quite soft at heart where his friends are concerned. The main crux of the story involves Toad developing an obsession with motor cars and, after stealing one and joyriding it around the countryside, he is taken to prison, from where he must escape. What surprised me most about the book is that it reads far more like a series of short stories. There is a central plot, certainly, but there are a couple of chapters that don’t do anything to drive the story on. That’s not to say I disliked them, but they’re a slow-paced addition to the novel. One involves Ratty (actually a Water Vole) meeting a seafaring rat who tries to convince him that the best way to live is to travel the world. In another, Ratty and Mole go to find Otter’s son, only to have something of a religious experience on the way. The book is also wonderfully illustrated, the drawings provided by E. H. Shepard, who also provided the famous illustrations for Winnie-the-Pooh. The novel is certainly of its time, and there’s nothing particularly offensive about it. There are villains, but they come into play late and aren’t much of a threat, and the four main characters are all certainly able to be described as “nice”. They do have flaws – Toad is conceited, Mole is stubborn, Badger is prone to grumpiness – but above all they want to keep one another happy. This is most surprising of Toad, who in adaptations seems to become someone that prompts questions as to why the others would bother to be friends with him. Here in the original text, Toad is shown to be generous, gregarious and intelligent, and you can understand why the others put up with him. The strangest thing about the book is simply that the anthropomorphism is so wonky! It’s not a complaint, because it’s actually quite funny, but it does seem odd that Mole lives in a burrow (although in some human comfort) and Ratty implies that some of the animals eat one another, but Toad lives in a mansion, drives cars, is tried via human courts and is apparently big enough to disguise himself as a human. On a couple of occasions as well, Grahame mentions Toad’s hair, which … well, I still don’t know what to do with that one. You just go with it all because to question it would be to ruin the charm. It’s a wonderful tale in a pastoral England that seems almost heavenly. Upon finishing, Mole, Ratty, Badger and Toad all feel like real friends, and I will not forget in a hurry the time I have spent with them.